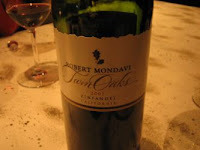 Robert Mondavi is an American wine. My dad bought it when he went on a business trip. Remember it or not, I posted the image on my Year-End Eatings post without any comment on this ;P It was very smooth and easy to drink! Robert Mondavi Winery is one of the most respected in the world, and Mondavi is the man who is most responsible for the worldwide recognition of American wine making, as well as changing America's palate for fine wine and fine food. How do you enjoy your wine? No snow left today. It is going to get warm from next week!